HRRN's Jock Talk show, episode #155. Presented by Tito's Handmade Vodka. 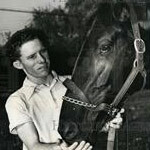 Kristina McManigell spends an hour with Hall of Fame jockey, Bill Boland.